We like gadgets here at PCstats, we really, really do... So when something comes along that excites that hidden need for all things tiny, shiny and technologically advanced, we review it (and play with it) as quickly as possible. Such was the case when MSI's Megaview 561 portable Multimedia player crossed our doorstep. Every tech company out there seems to be producing some variation of the portable video player theme. The idea is simple. Take a hard disk MP3 player, add an LCD screen and video decoding/playback hardware, shake well and release into the wild. In practice, its a bit more complicated to make one of these units work and sell well. For one thing, they are pricey. They have to be, given the additional components required for video playback and recording. Users Manual, AC Power adaptor, tripod, cary case, remote, software, headphones, audio and video cables, USB cable, lanyard, rechargeable battery. The potential of these units is tantalizing though. Instead of dragging a bulky laptop or portable DVD player with you on trips, encode a couple of titles from your DVD library into DIVX format (watch that digital millenium copyright act if you are in the US), drop them onto the MSI Megaview 561 via USB, slip the unit into your pocket and go. Every entertainment aspect that a laptop is capable of except games can be easily fulfilled by one of these compact babies. After all, who wants to take their laptop on a trip when they might be tempted to actually work? MSI's take on the video player comes a couple of years into the game, so they've presumably had time to watch other companies make mistakes. The Megaview 561 sports a 3.5 inch LCD, a 20GB hard disk, TV out and A/V recording capabilities, FM radio playback and recording, DivX and MPEG4 support, a full featured photo viewer, USB 2.0 and much more, making it one of the most capable multimedia video players on the market. You can record your favourite TV shows straight onto this players hard disk, then watch them on the road. Neat. Let's see if MSI's offering can match up to its considerable potential. MSI's Megaview 561 contains many, many features, so we're going to try to run through them quickly before getting to the meat of the review. 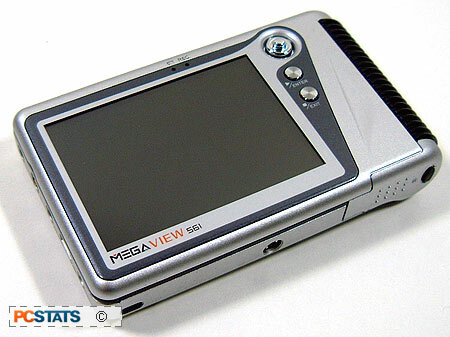 The Megaview 561's screen is a 3.5" LCD with adjustable brightness. A 20GB hard disk is used for media storage. The Megaview 561 is a USB 2.0 capable device which appears as a removable drive to Windows XP and 2000, meaning it can also be used as a portable drive, though MSI cautions against formatting the unit through Windows. Video playback supports the following video formats: MPEG-4, DivX 3.11/4.x/5.x, Motion JPEG and WMV-9. Video files are limited to 2GB in size per file. Video recording (via composite cable) is supported directly from TV or other video sources. Maximum video capture quality is 320x240 at 2000kbps with 129kbps audio. Voice recording can be accomplished via the built in microphone, creating MP3 files of up to 192Kbps sample rate. Recordings are limited to the maximum file size of 2GB. Audio playback supports the following formats: MP3, MPEG1 Layer 2, LPCM, ADPCM and WMA-9 Layer 2. maximum sample rate for MP3 and WMA is 320. No OGG Vorbis here I'm afraid. 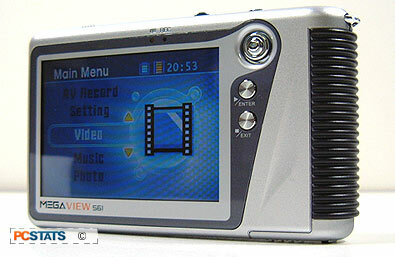 The photo viewing feature of the Megaview 561 supports JPEG, GIF, BMP and TIFF files. The FM radio playback and recording function allows users to tune in radio stations, store favourites and create MP3 files. An infrared credit card remote is included which can perform all control functions. The unit possesses a built in mono speaker and a stereo headphone jack. The speaker makes sounds audible, and that's about it. For music playback, it's best to use the headphones. Advertised battery life is 3 hours for video playback, 8 hours for audio playback (with screen off) and 7 hours for photo viewing. The Megaview 561 uses a Lithium Ion rechargeable battery pack rate at 3.7V, 2200mAh. You can also run the device from the included AC adaptor, which is highly recommended when recording audio or video.